Chestnut would love to meet you! Chestnut is shy and would do best in a quiet, experienced, adults only home as the only pet, and a house with a backyard. One look in Chestnut's eyes and your heart will melt! 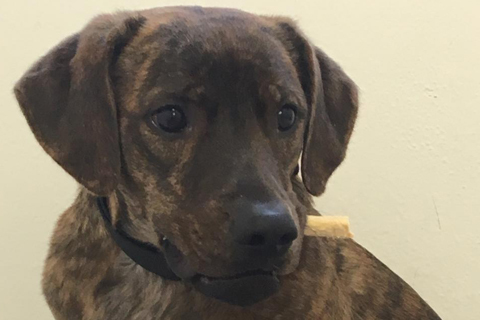 This sweet brindle Labrador Retriever mix is looking for a dedicated owner to love. Chestnut is acclimating slowly to the noises of the city--he is still quite fearful of loud noises and sudden movements. 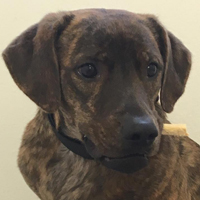 He would do best in a quiet suburban home with a fenced yard in which he can run and play to his heart's content. Chestnut is not a fan of other animals, so he would be like to be the only pet. He is also quite shy, so he will benefit from patient experienced adult owners who will provide him time to adjust to his new environment and help him come out of his shell. Interested in meeting his handsome boy? 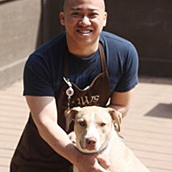 Stop by our Pippen Fasseas Adoption Center at 1997 North Clybourn Ave., in Chicago's Lincoln Park neighborhood today! Do you have a yard? I love yards! I am not a fan of new people - but I love people I know! Will you be my family?